A Charmed Wife: Parsley, Sir, Can I Have Some More? Parsley, Sir, Can I Have Some More? If I were going on Iron Chef (in a dream sequence, obviously) and had to categorize myself, I like to think of myself as a "French" style cook, as opposed to Italian or Asian. I derive this self-evaluation mostly from the fact that I cook almost everything with shallots, butter and parsley (and more butter). While parsley may seem like an unnecessary garnish, I think it gives a wonderful flavor and finished quality to almost anything, and I always have some in my fridge. I put it in salads, on chicken and fish, and in rice and pasta. In my world, everything gets seasoned with salt, pepper, and parsley. 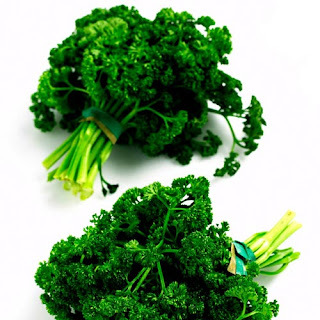 There are two kinds of parsley- the flat "Italian" kind, and the curly kind (shown here). I typically buy the curly kind because it is more readily available, looks prettier, and seems to last longer in my fridge, but people who really know what they're talking about say that flat is more flavorful. It's all about your priorities. If you buy fresh parsley, it should last in your fridge for up to two weeks. The best way to make it last is probably to trim the ends and put them in a jar of water (like cut flowers). Or, if you have a glorified mini-fridge like me, and would definitely knock over a jar filled with water the first time you opened the fridge door, you can do what I do- rinse the whole bunch in cold water when you get it home (it can sometimes be a little dirty or sandy), and then wrap it in a paper towel and put it in a Ziploc bag. To use it, just cut up the leaves using clean kitchen scissors. As a bonus to it's delicious flavor, parsley contains three times as much vitamin C as an orange, twice the iron of spinach, and is packed with cancer-fighting anti-oxidants. Which should, hopefully, do something to offset all that butter. Saw this today and thought of you! Bring a large saucepan of salted water to a boil. Add the rice and simmer over moderate heat until just tender, about 14 minutes. Drain thoroughly. In a large bowl, toss the rice with the olive oil and lemon juice. Stir in the parsley, frying pepper, olives, capers and lemon zest and season with salt and pepper. Serve warm or at room temperature with lemon wedges. Happy Martin Luther King, Jr Day!